No horses were hurt in the constructing of this piece. Yes they were. 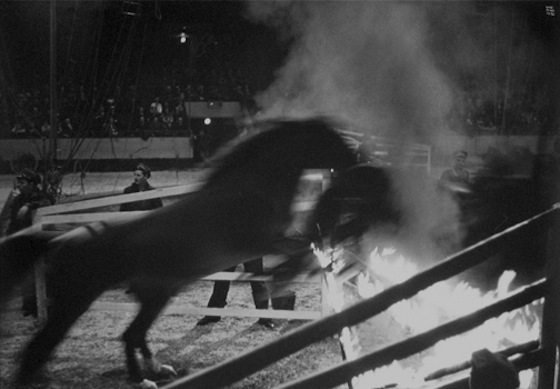 My fourth of five circus screamers reveals the latest tragedy to come to a circus performer--death by fire. Corral of Fire is the first circus screamer I've written with the prancing piano. A rock was placed on the sustain pedal to keep the mood. As the corral is built in the shadow of the spotlight, performers and horses march into the big top to the click of triplets. Marching soon gives way to a frenzied cantor that quickly gives way to a chaotic race to escape the hot lick of flames. To spoil the story, all the horses, though singed and marred, escape alive. The lead horseman, however, march as he may cannot escape the burning corral.